Outline with encyclopedic rigor the current state of the views of scientonomy community concerning the mechanism of scientific change, including changes in both theories and methods of their evaluation. Trace and document all changes in the field of scientonomy, as they are proposed and accepted by the scientonomic community. List and outline the open questions concerning the theory and the process of scientific change and thus assist with future research in the field. The encyclopedia was established in 2016 by scientonomic community. Its current editors in-chief are Paul Patton and Hakob Barseghyan. Pose Questions: The goal of this stage is to scrutinize the current state of the scientonomic theory and our knowledge of scientific change and identify as many open questions as possible. The annual seminar on scientonomy hosted by the University of Toronto's Institute for the History and Philosophy of Science and Technology is currently the main venue facilitating this stage of the workflow. Suggest Modifications: The goal of this stage is to advance our knowledge of scientific change by proposing modifications to our current body of knowledge. These suggested modifications are published and properly documented. These modification are currently published in the Journal of Scientonomy but, in principle, they can be published in any journal which makes use of the scientonomic mechanism of modifications. Once a modification is published, this encyclopedia documents that suggested modification. 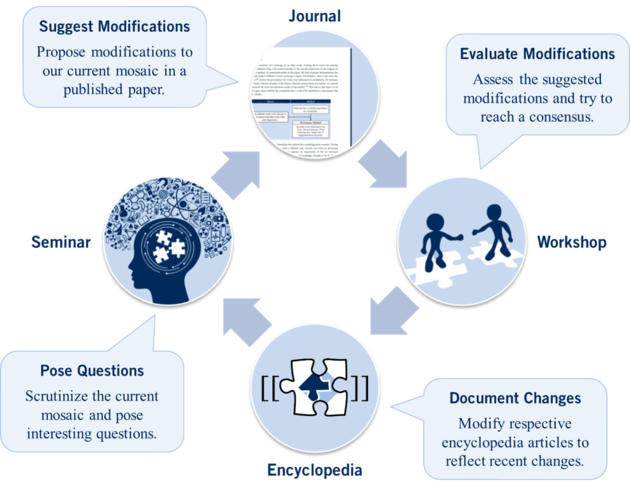 Evaluate Modifications: The goal of this stage is to assess the suggested modifications and decide which of them are acceptable and which are not. This is done by the community of scientonomists on the respective discussion pages of this encyclopedia. If a consensus emerges, the fate of the modification is documented. If a modification causes disagreement among scientonomists, it becomes a topic of discussion during scientonomic workshops, which aim at bridging the gaps between opposing parties and arriving at consensus. Document Changes: The goal of this stage is to document all the changes in our communal body of knowledge. If a modification is considered acceptable by the community, then the respective articles of this encyclopedia are modified to reflect that change. If a modification is considered unacceptable, then the respective verdict is documented for that modification. The primary role of this encyclopedia in the scientonomic workflow is to document the current state of scientonomic knowledge, trace all suggested modifications, and list open questions. Piecemeal: modifications to the communal mosaic are suggested one by one, which allows for a sober critical evaluation of these suggestions by the community. Transparent : suggested modifications and their evaluations are properly documented, so that there is no mystery as to whether, when, or why a certain modification was or wasn't accepted. The workflow is scalable, as it can - in principle - be implemented in other fields of digital humanities and beyond. This encyclopedia uses the semantic approach implemented via Semantic MediaWiki framework: the authors don't write their articles in a purely textual fashion (as is the case in most encyclopedias), but are asked to enter the relevant data in a structured, semantically meaningful way. Thus, once entered in specially designed forms, the data is stored in the database of this encyclopedia and is then automatically retrieved on any other relevant page. 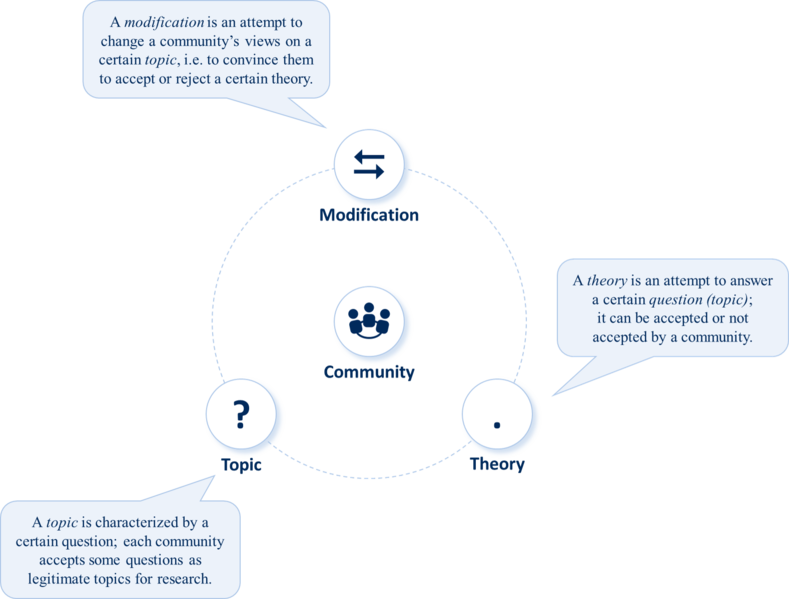 For instance, a theory's page allows the authors to enter the dates when the theory was accepted by different communities. Once this acceptance record is entered, it is stored in the database and is then shown automatically on the respective topic's page. Consider, for instance, the history section of the topic Mechanism of Method Employment; this section is generated automatically based on the individual acceptance records of the respective theories that attempt to answer the question of method employment, such as The Third Law (Barseghyan-2015) or The Third Law (Sebastien-2016). This makes it possible to trace the acceptance history of any theory or topic, keep track of the suggested modifications, etc. Community: This category lists all the communities recorded in this encyclopedia. Topic: These are all the questions that a community can accept as legitimate topics for research. The topics can be definitional, descriptive, or normative. Theory: This category includes all the individual propositions that attempt to define, describe, or prescribe something. Theories are attempts to answer a certain question (topic); thus, theories also come in three types: definitions, descriptive theories, and normative theories. Modification: Suggested modifications are attempts to convince a community to change its views on a certain topic, i.e. to accept and/or reject a theory. You can find instructions about how to enter bibliographical information in the guidelines for authors below. The first question you need to ask as an author: what kind of information are you going to enter? If you wish to create a completely new page, then what category does it belong to? Is it a topic page? I.e. is it a page on a certain question that different theories are attempting to answer? Here are some typical topic pages: Theory, Mechanism of Theory Acceptance, Scope of Scientonomy. If your page is a topic page, then check here. Is it a theory page? I.e. is it a page on an individual attempt to answer a certain question? Here are some typical theory pages: The Second Law (Barseghyan-2015), The Third Law (Sebastien-2016), Authority Delegation (Overgaard-Loiselle-2016). If so, go to this page to add a new theory. Is it a suggested modification page? These pages are usually added by the editors of this encyclopedia who trace all the scientific journals which make use of the scientonomic model of modifications and document those modifications in this encyclopedia. If you are an editor, then go to your community page first and add the modification from there. All communities are listed here. Is it a community page? First, try to locate the community in this list. If the community is not in the system, go ahead and add it. Is it a bibliographic record, such as a book, an article, or a collection? Then go to this page to add a new record. Is it an author? Authors of all bibliographic resources registered in this encyclopedia are to be entered separately here. If you wish to change something on an already existing page, locate that page and click on the Edit tab. A respective form will appear and, if you have the necessary credentials to modify pages of that category, you will be able to alter the data in respective boxes. If you have published in the Journal of Scientonomy or participated in a scientonomy seminar or scientonomy workshop, most likely an account has already been created for you. If you'd like to contribute but still don't have an account, please email us and we will create an account for you. If you have any questions, please feel free to email the co-editors in chief Hakob Barseghyan or Paul Patton. This page was last modified on 3 March 2019, at 18:12.